Yes, you can patent nature. Here’s why that’s a good thing. But did you know that non-GMO seeds can be patented, too? If you buy organic/non-GMO products because of the patenting issue, well, consider this – organic farmers can (and do!) use patented hybrid seeds. 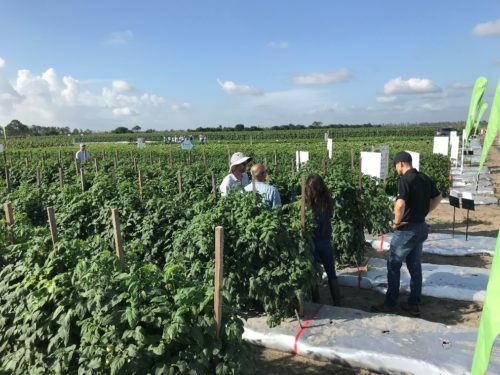 To be honest, I didn’t know a whole lot about hybridization until a recent visit with a few colleagues to the Seminis® research station in Felda, Florida. Walking down the lush rows of tomato, pepper, cucumber, and watermelon plants, we learned that hybrid seeds are a lot like GMO seeds in that they’ve been genetically modified to have a desirable trait. However, the genetic modification happens over many generations in the field or greenhouse rather than being more specifically targeted in the lab. Disease resistance is one such example of a trait that crop scientists at Seminis® and other companies incorporate into seeds. The same warm and humid climate that can be ideal for growing crops is also ideal for growth of bacteria that can infect and damage said crops. 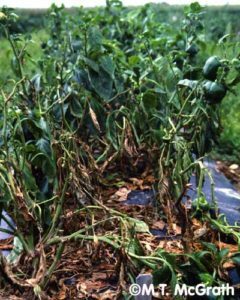 Bacterial leaf spot disease, for instance, can ravage bell peppers. 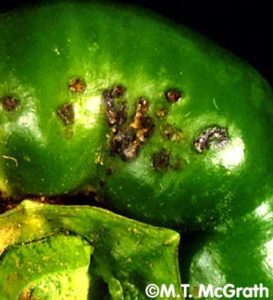 The disease causes scab-like spots to form on the vegetables (Figure 1) and damaged leaves fall off the plant (Figure 2). 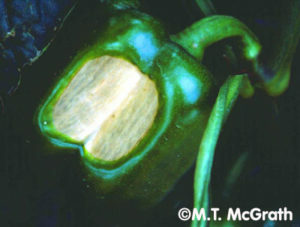 With less shade, the peppers can be exposed to sunscald which causes further degradation (Figure 3). So why does this matter to you, the consumer? Well, a smaller supply usually translates to higher costs, so an outbreak of disease in bell peppers could lead to more expensive stir-fries and fajitas (so sad!). Treatments do exist to combat disease and good farming practices can help prevent it, but another tool in the toolbox is to plant varieties that are resistant to infection. By breeding regular peppers with a wild variety that has resistance to bacterial leaf spot disease, Seminis developed hybrid plants that fight off the disease themselves. Although organic agriculture doesn’t allow for the use of GMO seeds, farmers often choose to plant crops that have been genetically modified through more traditional plant breeding techniques. 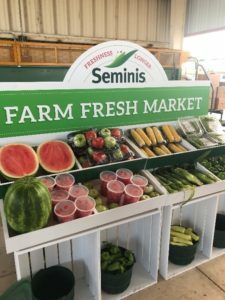 Learning about vegetable varieties and how they’re grown at the Seminis® research station in Felda, Florida. So yes, the seeds to grow these disease-resistant plants are patented. Not only is it beneficial for farmers in terms of a higher quality and more productive crop, but it helps the company protect the investments they’ve made. That money can then be reinvested in additional research and development. Want a watermelon that’s sweet but also stays firm and doesn’t get mushy? (YES PLEASE!) They’re working on it, thanks to income from patented products currently on the market. We tasted freshly picked fruits and vegetables that were grown just yards from this display. Delicious! Don't forget about the beautiful roses in your garden, either! After the Plant Patent Act of 1930 was passed, patented flowers and ornamentals became extremely common as breeders developed varieties of different colors, sizes, and even with unique scents. Note that whether they're meant for growing food or pretty flowers, patents on seeds don’t last forever. Just like pharmaceuticals, their patents run out after a certain amount of time, usually around 20 years. In the meantime, companies can recoup some of their costs, develop newer and better technologies, and we, the consumers, get to enjoy the literal fruits of their labors -- more affordably, deliciously, and nutritiously. Disclosure: I consult for Bayer Crop Science as part of their L.E.A.D. (Leaders Engaged in Advancing the Dialogue) Network. L.E.A.D. 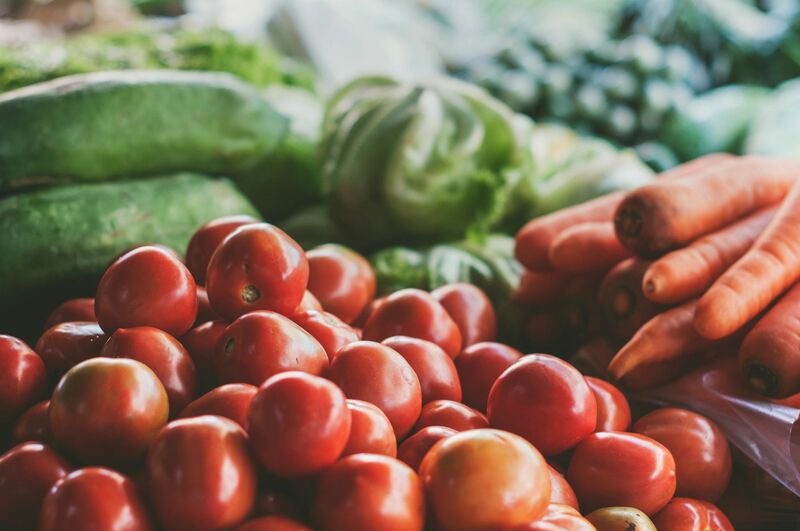 is comprised of leaders in the food and nutrition space who communicate with consumers and other food and nutrition professionals about how food is grown. My travel was sponsored by Bayer Crop Science. No compensation was received for this post. All opinions are completely my own. Great post, Leia! I, too, long for firm, yet juicy watermelon and am thankful for these techniques! Thank you so much, Nicole! Hopefully we’re not too far away from that firm-fleshed watermelon! Previous Previous post: I used to hate running. Now I’m signed up for a marathon. Next Next post: What is it like to consult for a “Big Ag” company?